In October of 1981 Arumugam Saravanapavan made a pilgrimage to see Gurudeva, Satguru Sivaya Subramuniyaswami, at Kauai Aadheenam. He had been missing the regular visits to the temple near his home in Jaffna, Sri Lanka, since coming to the US in 1970 with his wife, Pathmini, and his family. In Hawaii, Arumugam, a devout Saivite Hindu, was obviously overjoyed to be in a traditional South Indian style Hindu temple once again and expressed his appreciation to Gurudeva for his efforts to help build Hindu temples in the US. Arumugam described the efforts of the devout Saivite Hindu families and their desire to build a Murugan temple. 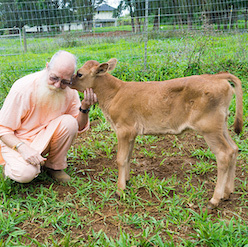 "Come back tomorrow," Gurudeva said. When Arumugam came the next day, Gurudeva presented him with a two-foot tall Deity, Valampuri Pillaiyar. This was the beginning of the Murugan Temple of North America in Lanham, Maryland. Arumugam passed into the inner worlds a few years ago, and to honor his memory his wife Pathmini recently established an endowment for the Pillaiyar shrine of the temple. She was greatful to Gurudeva and felt it was important for her family to continue supporting the shrine and to guarantee the upkeep and maintenance of the shrine with flowers, oil for the lamps, Deity clothing and so forth. Pathmini asked that the Arumiku Valampuri Varasithi Vinayagar Shrine Fund, the formal name of this endowment, be a single donor fund and that donations to the fund be limited to members of her family and their successors. The initial fund (#39) was established with $5,000. 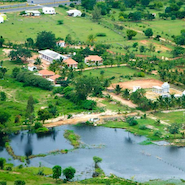 The Pillaiyar shrine will begin receiving approximately 4% of the fundís principal, or $200, next year as its first grant. Pathmini is also keen that the younger generation be interested and participate in the activities of their temple. She established a second endowment for the temple (#45) to help fund the annual festival (in 2003 it was August 9th) which is held to inspire the Hindus of Sri Lankan (Eelam) origin and to help remind them of their religious and cultural heritage as exemplified at the Yalpanam Nallur Temple and Kathirkamam Temple in Sri Lanka. This fund was initiated with a $5,000 contribution, and each year the grant would provide funds for the festival such as abhishekam items, food, musicians, decorations, flowers and promotion, etc. This is a multi-donor fund, which means it is not restricted to an individual or group of contributors, and anyone who is inspired can contribute. Pathmini also felt is was important that her family and friends and their descendants be involved in helping to promote these festivals now and into the future. 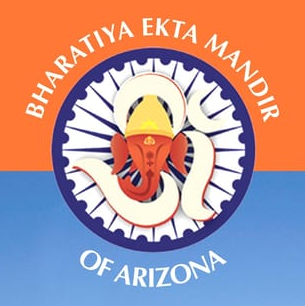 Since the early 1960s, Hindus from India have been establishing themselves in the US, largely in the professional community. Among them was Dr. Grandhige Raghu and his family, who settled in the Atlanta, Georgia, area. Recently he and his relatives back in India decided to rebuild a Siva temple in their home town of Tiptur, Karnataka. To finance the reconstruction and help maintain the temple in perpetuity, Dr. Raghu established an endowment. He chose the option of financing a foreign charity through income tax savings by giving a donation to HHE earmarked for the temple and included an extra amount equal to the amount he saved on income tax (almost $30,000). HHE kept the tax savings amount for the endowment and gave a grant to the temple in India of the normal donation. He achieved additional tax savings by donating common stocks, and all capital gains tax was avoided on the stock sale. These savings were added to the charitable deduction savings. In his fund proposal document, Dr. Raghu included a boysí youth hostel and a girlsí youth hostel as additional beneficiaries. The initial fund, a multi-donor fund (#48), was established with $28,538.21. Next year the fundís beneficiaries will share a grant of approximately $1,141.53. HHE may be the best way to send tax-deductible money from the USA to a foreign religious charity and at the same time create an endowment for that charity. For more information email hhe@hindu.org.